Home > News & Views, Other Sites	> Christianity in Sharp Decline in the U.S.
Christianity in Sharp Decline in the U.S. I hadn’t planned to cover this story: America’s Changing Religious Landscape: Christians Decline Sharply as Share of Population; Unaffiliated and Other Faiths Continue to Grow by the Pew Research Center. It did get a lot of attention. The AP put out a piece that was picked up by news outlets around the world. Some papers, particularly those with ingrained secular agendas seemed gleeful. A woman once told me she loves the Shroud because "It makes it real". Apparently more and more people are having a hard time accepting the reality of Christ and the ransom He paid for all of us on the cross. This is not a good trend. Be wary of tipping points. Our culture is fast falling away from its spiritual foundation. Pray that we as a nation return to our first love (Rev 2:4). Most mainstream reporters took their cue from the report’s headline: Christians Decline Sharply as Share of Population; Unaffiliated and Other Faiths Continue to Grow. They seemed unaware there’s been a ton of books out in the past seven years about increasing numbers of disaffected Christians – especially the young – who are leaving church. More on that old-news angle later. 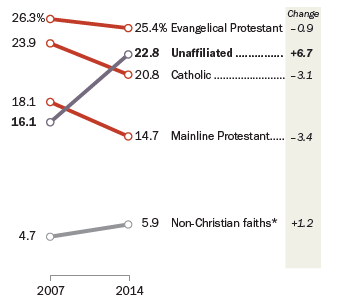 To sum it up, the "nones" (2012 study found here) are still growing, other religions are up a bit or holding their own and mainline Protestants and Catholics are declining very, very fast. Evangelical Protestants, now the dominant stream of the nation’s Protestants at 55 percent, went down by less than 1 percent, hardly a “sharp” decline. But it took some scribes awhile to arrive at that important distinction. Some of the headlines were almost celebratory about the nones who now “soar” as the Christians decline. Notice the headline on this RNS story, which gave a pretty evenhanded report on the survey and some good information on the “nones” …. So what does this have to do with the shroud? What might it have to do …? However, the importance of the Shroud is demonstrated by the vehemence and at times delusional rantings of the pseudo-skeptics who believe that the debunked carbon tests and the hearsay D’Arcis memorandum prove the Shroud inauthentic and blithely dismiss the pertinence of the Pray Manuscript and the physical evidence of the Shroud itself. Get used to it: the stains are of real blood and the properties of both the image and the bloodstains have attributes that were unknown in medieval times and beyond the knowledge of anyone until the eighteenth and nineteenth centuries. Science supports the authenticity of the Shroud. It took the advances of science in the past 115 years to provide the tools by which the Shroud could be properly analyzed down to the quantum level. None dare call it providence! I’ve read this recently too. However, Christianity is growing in Africa and Portugal, Spain and some of the other European lands. When was Christianity a “numbers game?” From the earliest days of faith, Lot beseeched the Father to spare a hateful, wicked place for the love of ’10 righteous men.’ No soap, no 10 good guys. How many people were at the foot of that Cross? Two. How many people hung around on Sunday to try and give the Body of their Master a little dignity in death, as He had given them love in life? If this represents the message of Christ, the continued decline of Christianity and the utter discredit of the Shroud is assured. Thank goodness there are authenticists (and non-authenticists) who understand that there is reasonable evidence for both origins, accept that what seems more convincing to them is not so to others, and have the generosity both to explain why they disagree with their opponents, and to accept that, even so, they may not change their opinion. Hugh, stop being such a blathering delusional ranter so blithely dismissing all of our blathering delusional ranting and whatever it is that blithely means. What evidence non authenticists hve other than flawed Carbon Dating Results? This is all evidence to me that Christ is on the verge to return, soon. I think about the great Falling away, the murders of our Christian Brothers and Sisters, the Murders of Jews, etc… I can almost hear the Martyrs crying out vengeance for their deaths. Yes, religion is in decline around the world, except a few countries (Spain is not between them, Kim). However, religion continues to be dominant in a lot of countries. That said, to believe or not to believe is not the problem to me. The problem is when believers support his religion with insults and irrationality (not to mention physical or legal aggression). I don’t know any survey that has studied the question from this outlook. Some people think that by expressing their holy anger they work or show that they are working for their cause. In some circumstances they can terrorize, but never convince their opponents. But since we are in a forum, which is a place where terrorizing is impossible, they should consider that their insults have no effect, except to disgust the sensible people. Perhaps Hugh is more sensitive to verbal aggressions in this forum because his beliefs are nearer to the aggressors than mine. Such a thing as “troll”, “delusional ranting” , etc., leaves me cold or makes me a bit of laugh. But they aid me to know when discussing with someone is useful or not. To discuss with an intolerant or an exalted one (“energumen”?) is a loss of time. David, I read Paulette’s comment and the way it is written, I think she meant for a joke. Honestly, I could be wrong but she looks like she is needling him for taking the article’s language a little too seriously. People are people and people are biased for or against a cause, human nature is what it is. Obviously Hugh didn’t take it that seriously, by his answer! I have seen him go off on people and believe me, if he thought he were being attacked he would flip on the high-beams in a hot minute. I completely and whole-heartedly agree with you, we can be sincere people without forcing our beliefs on anyone. Those who do are, in their heart of hearts, not convinced that what they believe is true, and they won’t be, until EVERYONE believes the way they do, or at least until everyone is too intimated to argue with them. Interesting, Dan. This would mean in terms of mere numbers that Christians went from 68.3% to 60.9%. I find the greatest value of the Shroud as a Christian is as a witness tot he power of Jesus. The computer just automatically shut off and I lost my reply. It boiled down to, It is not God nor Jesus in the churches or religious organizations it is Satan, and if you want to read about it in the King James Bible of 1611 go to Isaiah 14:13-14 or Joel 1:13 or St John 14:30 St John 8:38, 44, 45 or St John 5:43 The preachers are preaching what Paul said that is why God removed the Spirit for redemption and Holy Ghost, from the churches. [https://www.createspace.com/4612897} If you don’t believe me go to the church of your choice. As an avowed authenticist, I have noticed that the trolls and blather on this site are not merely confined to the skeptic lobby. Absent the righteous vituperation, and John K still makes the valid point of the importance of the Shroud to Christianity, an under-utilised witness to the sufferings of Jesus, and a witness to the reality of the message of great love that he preached. Elsewhere I have recently written that the focus on the “authenticity debate” that we see too often on this site is an unnecessary distraction from that message. This seems to be a theme taken up by all recent popes, all of whom personally seemed to accept authenticity, but saw little need to argue its case. To them, it was the message that was more important. To Josie: Perhaps the disregard of the elderly is a by-product of a materialist consumer society, which greedily seeks to take the money from the more gullible young. In this country, the elderly are clearly valued for their experience by the indigenous Maori, and our many ethnic populations from the Pacific, the Philippines and South-east Asia. My advice – Join up with a few clubs for the elderly that value your experience, say U3A, voluntary work, or take up Lawn Bowls. You should find plenty of supportive intelligent company to your liking there. Christianity in decline? What else can you expect in a country where Reza Aslan can freely talk about Jesus – as a zealot? The latest from him? He recently saíd on a videotaped interview that ISIS got its ideology from the Old Testament. Will he find support? Perhaps. Orthodox Rabbi Ben Abrahamson hás said that Judaísm is like Islam. This comes years after histórian Paul Johnson wrote that he wished for a superior form of monotheism. Freud would have had the last laugh if he were here with us today. That is the world we live in. Faith dies first -society next.